Chinese retailer JD.com has announced the successful pilot of Indonesia’s first government-approved drone flight for delivery. The test flight took place on January 8, 2019, in West Java, Indonesia, where the drone flew from Jagabita Village, Parung Panjang to MIS Nurul Falah Leles Elementary School to deliver backpacks and books to students. Like many remote areas, the village is almost inaccessible by delivery vehicles due to the roads conditions which make delivery challenging and slow. Representatives from Indonesia’s Ministry of Transportation, Civil Aviation and Air Navigation were present for the flight. JD.com and its subsidiary in Indonesia, JD.ID, were early e-commerce movers in the country. JD.ID launched its e-commerce operations in 2016, and now claims to sell 1 million SKUs to more than 20 million consumers across the country. Its operations leverage a logistics network consisting of ten warehouses across seven islands, covering 483 cities and 6,500 counties. A Mckinsey report released in August 2018 shows that the total e-commerce market in the country is expected to grow from $55 billion to $65 billion by 2022. However, among the challenges cited in a country with over 18,000 islands is logistical bottlenecks. But in 2017, the country has already about 30 million online shoppers, approximately 15 percent of the total adult population of 195 million, with a lot of room to grow. 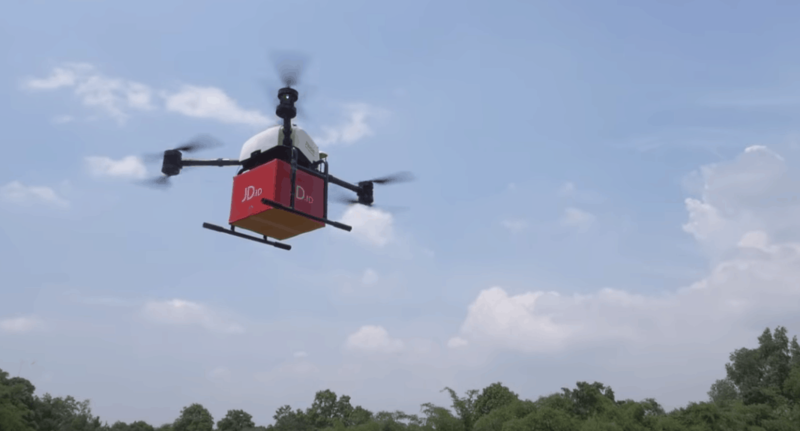 JD.com said the implementation of drones for regular use in e-commerce deliveries and other logistics-related service is expected to help deliver 85 percent of orders same- or next-day. JD.com started developing drones in October 2015 and launched the first trial runs to customers in June 2016. The company fact sheet shows that it uses seven types of last-mile delivery drones and has more than 100 drone routes in several provinces in China. It has an agreement with the Shaanxi provincial government to build China’s largest low-altitude drone logistics network, spanning a 300 kilometer-radius. It is a also a strategic partner of WEF and a partner of WEF’s Centre for the Fourth Industrial Revolution (C4IR), a global hub for multi-stakeholder cooperation to develop policy frameworks and advance collaborations that accelerate the benefits of science and technology. Leveraging drone technology to deliver supplies to areas in need is a high priority on the C4IR’s agenda. WEF and JD have been working closely together to ensure the success of the pilot in Indonesia. “This trial represents the first government approved drone delivery operation in Indonesian history,” said Timothy Reuter, Head of Drones and Tomorrow’s Airspace at the World Economic Forum. “These tests are an opportunity for Indonesia to become a leader in the Southeast Asia region by leveraging drone delivery to improve access to vital medical, humanitarian, and commercial goods in remote areas,” he added.